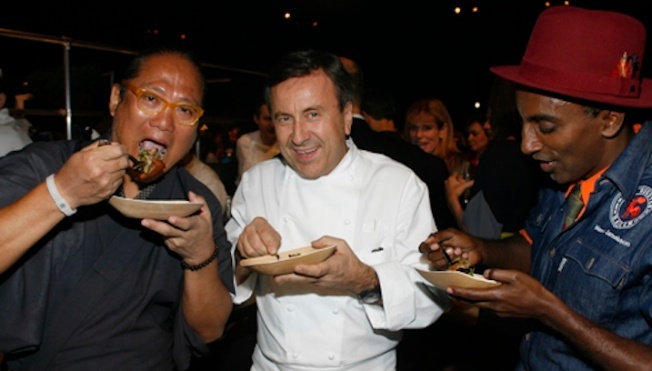 Morimoto, Daniel Boulud and Marcus Samuelsson at last year's TRAVEL + LEISURE Global Bazaar. What could be more fun than checking out TRAVEL + LEISURE magazine’s Global Bazaar event this upcoming weekend at the Lexington Armory? Inspired by the night markets in Bangkok and curated by T+L’s ace editors, there truly is something for everyone at this extravaganza, with all events classified under “Eat + Drink”, “See + Do” and “Shop." You can sate your palate on delicious cuisine and watch cooking demos by culinary stars including Jose Andres and Michael White, taste your way through a fleet of food trucks, and imbibe cocktails and wine from several different parts of the world. And if that’s not enough, there is ziplining, jewelry-making, dancing, shopping and more, from a huge range of countries from the Caribbean to the Middle East. Global Bazaar runs September 28-30 and is the best showcase for international interactive experiences and epic multi-culti fun--you can travel the world all under one roof!